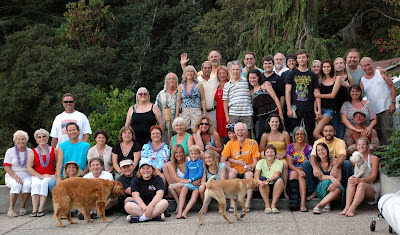 Ventura Dreaming: Summer Soiree 2008 - A Great Time Had By All! Summer Soiree 2008 - A Great Time Had By All! The Pattons and Richard & Nancy outdid themselves again - they organized a better weekend than any of us could have asked for! It was great to see everyone again, especially so many of our kids, who are about the age most of us were back when these Summer Soirees first began back in 1976! 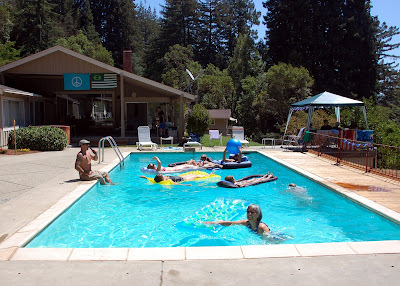 Thankfully, I got my cast off last week, so after a nice visit with Julie and Gabe in SLO, we arrived at Wildwood and I got to enjoy the pool as well as old and new friends, great food and drink, and beautiful views of the Santa Cruz Mountains. As we would often say while floating in the pool with our drinks, "They sure run a great place here!"